When paying down debt, one thing that many people find helpful is a debt snowball; this is actually a central element in the popular financial management plan by Dave Ramsey. The debt snowball is a simple concept: you make minimum payments on all of your credit cards, except for the one with the lowest balance. That card, you pay as much as possible towards each month until it's paid off. You then take the money that you were putting towards payments on that card and put it towards the card with the second lowest balance, and so on, until you have no balance remaining. Once a card is paid off, it's put away and no longer used. From a strictly mathematical standpoint, this is silly: you pay the least by putting your money towards the card with the highest interest rate. From a psychological standpoint, however, it can be very effective as you gain a sense of accomplishment from seeing your debts disappear; the satisfaction of having fewer bills makes it easier to keep on saving, whereas putting money towards a card with a higher interest rate but also a higher balance can mean that it takes longer before you can really see the difference your actions are making. Additionally, every time you pay off a card you get to write a bigger check towards the next one! Of course, once you've paid off all of your credit cards, since you're in the habit of saving it should be simple enough to redirect the money you were putting towards the credit cards into retirement savings or to pay off a mortgage. Then you're well on your way to financial independence! A bankruptcy notice (technically, a "proof of claim form") lets you know that someone who owes you money has filed for bankruptcy, and gives you a deadline by which to reply if you wish to file a claim against the debtor's assets. It is sent by the court to every creditor the debtor has informed the court of (presumably all creditors, since only the listed debts will be discharged). How likely you are to actually get paid depends on the type of bankruptcy. In a chapter 7, where most debts are discharged, assets may be discovered that can be used to partially pay off the debts, but generally you're unlikely to receive much. In a chapter 13, the debtor's payment plan will require him to pay you at least part of what you're owed. In either case, if you can show that you have security in some asset, this will move you to the front of the line to get paid. Once you have the notice, if you're owed enough for it to be worth your time, you need to file a proof of claim to be included in the bankruptcy proceedings and collect whatever portion of the debtor's assets you're entitled to. The notice also lets you know that you can no longer attempt to collect the money owed, as the debtor is now under bankruptcy protection. In some cases, it's possible that the bankruptcy notice may reach you after the deadline has already passed. According to section 342(g) of the United States Bankruptcy Code, notice given is not effective notice until it is brought to the attention of the creditor, which means that if the notice does not reach you due to being sent to the incorrect address or similar reasons, you may be able to dispute the missed deadline. Don't know what to do with the retired person in your life? Here are a few quotes and sayings about retirement. You're only young once but you can be immature all of your life. When I die, I want to go peacefully like my grandfather did. In previous posts, we've mentioned that borrowing money against your retirement plan is generally a very bad idea. A self-directed IRA is something different: it allows you to use your retirement funds to invest in your business. Why would you want to do this? As we've discussed, the nice thing about a Roth IRA is that your money grows completely tax-free; thus, it's a particularly good vehicle for income sources that would otherwise be heavily taxed. If you're working hard on your business and growing it rapidly, you may be seeing a large return on your investment, which you're then taxed on. If your Roth IRA owns most of the business stock, then not only did that give you access to your IRA funds for business capital, but the return from your business will be tax-free! Of course, this does mean that you can't touch the money until you retire, so be sure to keep enough income coming your way to live on! The IRS wants to make sure that your IRA really is using to save for retirement, rather than just for avoiding taxes now. To avoid trouble with them, read through the list of prohibited transactions and be very careful to avoid anything on it, as breaking the rules here can result in losing the tax-favored status of your account! Among other things, this means that your parents, children, and spouse are not permitted to invest their IRAs into your business (although your friends and siblings can). Also, you may not borrow money from the account, sell property to it, or use it to buy things for your own use. You're also not allowed to own more than 50 percent of the business you invest in, and you shouldn't invest in an S corporation or general partnership. If you don't have a business yet, you can also use your IRA to buy one, although this may subject you to the unrelated business income tax. One nice thing about having people invest in your business through an IRA is that the structure of the retirement plan discourages them from pulling out their investment early, which can be a big help for your business. A self directed IRA does require that you use a special custodian; depending on where you set up your retirement account, your custodian may limit you to certain types of investments (mostly ones the bank sells) or may allow you to invest wherever you like and simply handle the record keeping. For more information on self-directed IRAs, refer to section 408 of the internal revenue code. 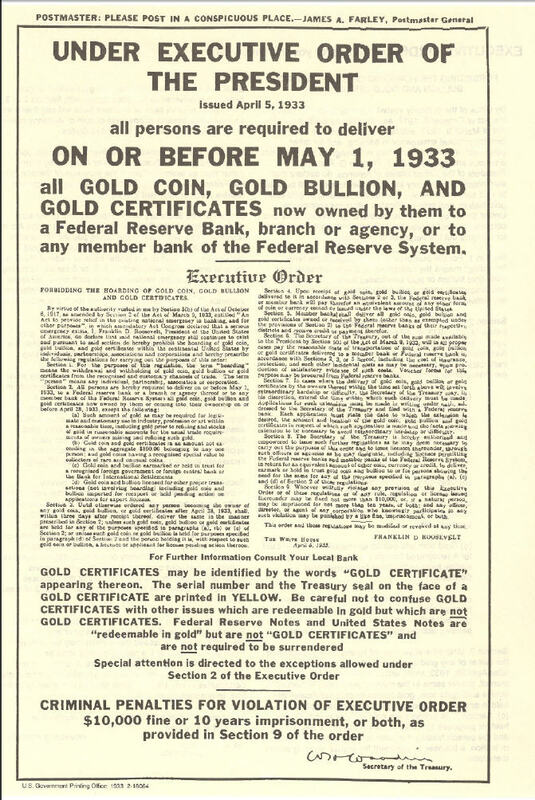 If you've been considering investing in gold, and have been doing your research, you've likely run across a number of warnings from dishonest dealers that you should buy collectible gold coins rather than bullion, as the collectible coins are safe from government confiscation; they then cite executive order 6102, issued by Franklin Roosevelt in 1933. There are a few problems with the story. The first is that, contrary to the claims you'll hear, the federal government never confiscated gold; while citizens were ordered to surrender gold, they were fairly compensated. Additionally, there was only one prosecution of someone failing to comply with the order, and it was unsuccessful. Furthermore, the purpose of the executive order was to get people to stop hoarding gold at a time when America was still on the gold standard; Roosevelt was attempting to prevent a run on the banks. Accordingly, there's no particular reason to think the government would attempt to confiscate anyone's gold, which is why the American Numismatic Association describes this as a non-issue. If you were to ask us flat out, "is gold a good investment? ", we'd have to say no. Historically, gold has vastly underperformed the stock market; indeed, if you had invested in gold 30 years ago, you'd have about the same amount of money now as if you'd just bought government bonds. Not exactly outrageous earnings, there! However, if you do decide to buy gold, we want to make sure you get the best deal. Perhaps the most popular way to buy gold is with gold coins; aside from the value of the metal, you also get a nice collectible. Additionally, because coins are standardized in a way that gold bars are not, it's much easier to assign the correct value to them, and they are also more difficult to fake. Gold coins have been around for a long time; the first known example is the coins minted in 670 BC by King Gyges of Lydia in Turkey. Generally investors will buy gold bullion coins, which have their gold content guaranteed; while these coins are legal tender, their real value is based on the current value of its gold content; as such, a 1-ounce gold bullion coin will generally sell for the same price as one ounce of gold, plus a small premium. Again, the main draw of a gold bullion coin is that it's an easy-to-obtain form of pure gold whose authenticity is guaranteed by the country minting it. There are a lot of fraudulent companies trying to sell gold coins, so it's important to do your homework; most importantly, never let a salesman rush you into a purchase.Once you've purchased your coins, if they are not bullion it's a good idea to have them graded as soon as you get them; even if they come with a certificate, the certification may be from a dishonest grader or one that uses looser standards than commonly accepted. Bullion coins do not need to be graded because they are being purchased for the gold value, not any collector value. As with any major purchase, always comparison shop to be sure you're getting the best price. Another thing to be aware of is that dealers will likely quote appreciation rates from the Salomon Brothers Index, which is a legitimate index that used to be compiled by the New York investment bank Salomon brothers and can show very high appreciation; however, this list was based on very rare coins, not the more common ones the average investor is likely to purchase. Again, the value of gold bullion coins is based on the market price for gold, rather than any particular rarity of the coin. There are a few professional organizations you may find useful as you get started in coin collecting. The American Numismatic Association offers a number of educational programs for collectors, while the Professional Numismatists Guild consists entirely of coin dealers who have a minimum net worth ($250,000 in coins) and number of years of experience and who have agreed to submit to binding arbitration through the PNG in case of complaints. One of the most popular forex indicators, moving averages are also one of the simplest to compute; however, professionals are always coming up with new strategies for using them! Here are a few of the basics. Recall that the moving average is used to show the market's momentum. We can take the simple moving average, which is just the average closing price over the time period we're using. We can weigh the average, with more recent prices having greater weights; depending on how much more importance we want to place on recent events, we can use either linear or exponential weights. We also have the option of using all past prices, rather than just a limited number, but giving those in the distant past very low weights. There are three standard methods that underly most strategies for interpreting the moving average. One of the most common occurrences is a crossover, meaning that the price has risen above or fallen below the moving average; in other words, the current price just crossed the average price. While this isn't incredibly useful, it can help when combined with other predictive methods. While the moving average measures trends in the price, it can also demonstrate a trend itself; moving average trends can be used to decide when to buy or sell a currency. Again, this indicator is not particularly reliable by itself, but can be helpful when used in combination with other indicators. The disadvantage of the moving average is that it takes time for a market event to show up, at which time it may have already ended. The advantages are that the moving average indicators are simple and easy to use; while they shouldn't be used as the sole indicator, they can certainly provide support to decisions based on stronger indicators the trader may have available. While major banks may be able to make money off of forex trading based solely on the spread, individual investors generally need to be able to predict how the market is going to move in order to make a profit. As you might imagine, there are a lot of very smart people trying to figure out how to make this prediction; in this post, we'll briefly mention a few indicators that forex investors use. Before we start, let's be clear on exactly what a forex indicator is. Indicators are used to find patterns; while the currency market is very chaotic, it's possible to find various inputs that will have a somewhat predictable effect on the market, and thus we can use indicators to predict how the market might behave. Naturally, different indicators will pull in different directions, contradicting each other; while it is tempting to attempt to use as many indicators as possible, perhaps a better approach is to find a half-dozen strong indicators and move only when almost all of them are in agreement. This post will be updated to explain other indicators in the near future.